Spring is here on the Delaware Bay and anglers anxiously await the first reports of huge black drum. After our long, cold, hard winter and few fishing opportunities from January – April the arrival of black drum is a welcome relief. This article will provide anglers tips on catching these big drum in the spring on the Delaware Bay out of Cape May, NJ our home port. There are few fish more exciting or harder fighting fish than these big drum. When these fish reach 35, 40, 45, to over 50 inches in length they have such power and can give anglers the fight of lifetime. When these fish get hooked they scream off your line with rod bent over hard. Tackle and Rigs These are big powerful fish so you want to use medium to heavy tackle. I recommend against using very light tackle which prolongs the fight endangering the fish which might not survive once released. Most of my reels have 40- 65 lb. braided line but you can use mono too. A fish finder rig with beads on both sides on the main line tied to a barrel swivel connected to a short 80 mono leader with a snelled circle hook is the rig I like. The fish finder rig allows the line to be pulled through the fish finder rig leaving the weight in place so the fish does not feel the weight. Short leaders of only 2 foot are best so you can cast farther. 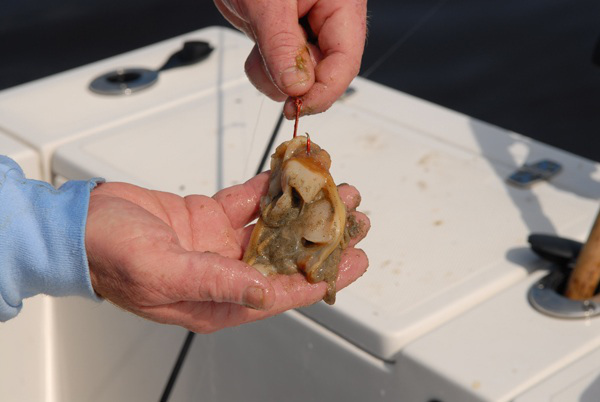 A bank, pyramid, or pancake sinker is attached to the fish finder rig to hold the bait to the bottom. You want a sinker that has flat sides so it does not roll in the current. You will have to adjust your weight as the current increases or decreases. Always make sure your baits on the on the bottom. The current out there can rip so check your lines often making sure they are on the bottom. For this reason I highly recommend circle hooks. At least an 8/0 circle hook. Circle hooks will most often set in the corner of the mouths for a clean release. For these fish there is no need to set the drags light or free spool and let then run before setting the hook. You will get a much higher hookup ratio by setting the drag at strike so the hook sets as soon as the fish runs. Your rod will be bent over hard with drags screaming. Don’t let others convince you to use J hooks. J hooks will cause more gut hooked fish with higher mortality. Be a responsible angler and use circle hooks to protect this fishery. The hookup ratio is excellent with circle hooks. If you can find big, smelly sea clams that is ideal but chowder clams work. We use all surf clams we purchase from the clam boats in Cape May. Spread and Fight Fishing from anchor can be challenging at times. If the wind and current are reasonably aligned everything is good as the lines all go towards the back of the boat. If the wind and current are opposite then things get more challenging. You want to fish as many lines as your crew and boat can manage. I like to use the spinning reels and cast out as far as I can. Often the lines farthest from the boat get whacked first as the school approaches your boat. Then I will put conventional reels that don’t cast well closer to the boat. As mentioned, with circle hooks, set your drag at strike letting the hook set as soon as the fish runs. Then clear only the lines that are in the way or risk crossing. Keeping lines out increases the odds of double or triple hookups as there are usually more fish around when the school moves in. Enjoy the fight but don’t prolong it. Once the fish is alongside the boat, land the fish with a large landing net. Once the fish is inside the net, point the net handle straight up in the air and lift using the loop of the net. If you try to lift using the net’s handle, odds are you will break your handle as these are heavy fish. Lift the fish by supporting the body of the fish, take a quick photo and release the fish as fast as possible. Don’t hold the fish by the gills or lift the whole fish by just the mouth. Support the fish and body with both hands/arms. You want these fish to survive and reproduce. If you think the fish is distressed, you can lay the fish gently in the water holding by the mouth (still supporting the body as you lower it) while the current runs over the gills until the fish is revived. Most often if the fight and release was fast there is no need to revive them. *This post was inspired by a post originally on The Bass Barn. The image is not mine and was borrowed for this posting.